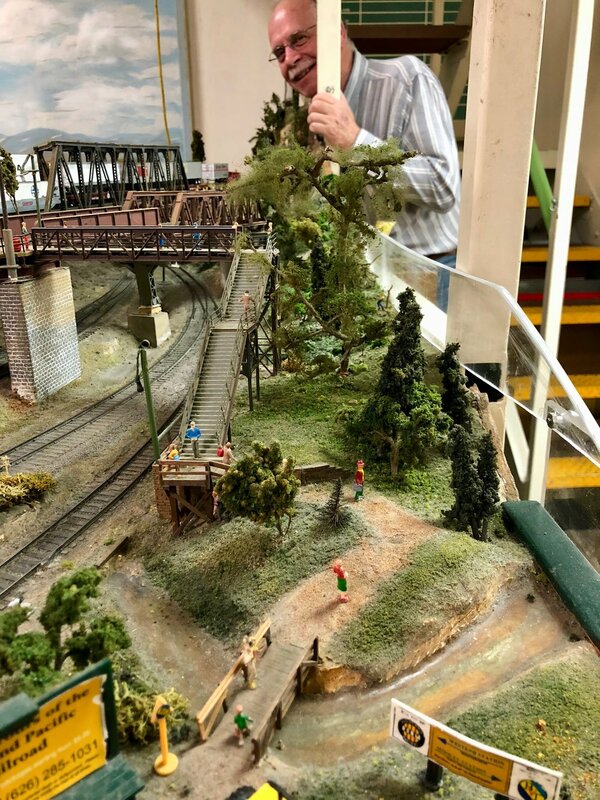 Scenery Upgrades Proceed Apace — Highland Park Society of Model Railroad Engineers, Inc.
Gerry overlooks his recent handiwork. The past couple of months have seen a burst of color on the west side of layout from Bayshore to Deka siding. The most recent revitalization was to the area around West End Yard up past Bayshore Valley Traction Station to the west. Gerry Willis is the groundskeeper on this project. You can see how much brighter the scenery upgrade has made the layout in the photo at the right. Notice the better-defined path leading to the steps up to the bridge and trolley station. The greens are more vivid no doubt enhanced by the newly replaced trees. Some of the new trees here and along the layout edge near Bayshore are from Gerry's own layout that he had when living in Reno. Other materials come from the stock of scenery supplies that have been hidden in various parts of the club rooms for many years. The new and repurposed materials used in this project look so much better because they are not covered by a patina of 50 years of model railroad dust. Come on down and check Gerry's work. He will give you a personalized tour of the newly renovated areas. Keep moving or he will give you a tree to plant.